It has to be one of the most unexpected phenomena in the church today–that white middle-aged pastors are talking about rap music and, even more strangely, actually listening to it and recommending it. I don’t know that anyone would have or could have predicted it. I certainly wouldn’t have predicted that I would be one of those middle-aged white guys. I love the music and am fascinated by the phenomenon (which is why I’ve written about it here and about the John Piper connection here). 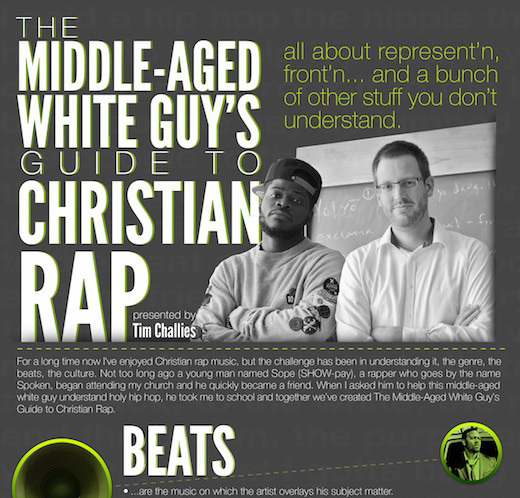 That is also why I’ve prepared this infographic: The Middle-Aged White Guy’s Guide to Christian Rap. Enjoy! If you want a super-high res version, here’s a PDF for you.